Supporters of Venezuela's President Nicolas Maduro walk past a campaign mural before a rally with him, in Charallave, Venezuela, May 15, 2018. Venezuela's diplomatically-isolated president received a show of support from Turkish counterpart Tayyip Erdogan on Thursday ahead of a weekend election boycotted by the opposition coalition and decried by Washington. 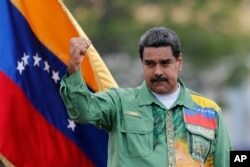 The United States, the European Union and major Latin American countries have criticized Sunday's vote in which leftist President Nicolas Maduro is likely to win re-election to a six-year term. Venezuela's President Nicolas Maduro raises his fist during a closing campaign rally in Caracas, May 17, 2018. So foreign shows of support are particularly welcome as Maduro seeks to legitimize his likely re-election despite a brutal economic crisis that has Venezuelans skipping meals, succumbing to once controlled diseases, and emigrating en masse. In a split screen chat broadcast live on Venezuelan state television on Thursday, Maduro and Erdogan held a stilted, translated conversation that had several technical problems. "I wish you much success in the coming election, and a month later I think we're going to have success in Turkey. One of my first tasks will be a state visit to Venezuela," said Erdogan, in reference to Turkey's presidential and parliamentary elections on June 24. Turkey's President Recep Tayyip Erdogan, right, gestures as he speaks to Venezuela's President Nicolas Maduro during a conference call, in Ankara, Turkey, May 17, 2018. "I have faith you will be triumphant," Erdogan told Maduro, whose main rival is former state governor Henri Falcon who broken with an opposition boycott to run for the presidency. Critics scoff that both Maduro and Erdogan are in fact authoritarian leaders who have snuffed out dissent and mishandled their economies. "For the Venezuelan government, this election is not designed to look legitimate in front of the Western world, but rather in front of the illiberal world like Russia, China, Turkey and Qatar," said opposition lawmaker and economist Angel Alvarado. "Maduro will try to present himself, not as a democrat, but as a government that has popular support ... to have a bit of legitimacy and receive financial help." China and Russia have lent Caracas billions of dollars and both have significant oil fields in Venezuela, home to the world's biggest crude reserves. Turkey has a much smaller presence, but Turkish Airlines started flying to Caracas in 2016 - one of a few major international carriers to still service the violent country - and Venezuela's government has said Turkey would invest in its new "petro" cryptocurrency. Maduro and Erdogan on Thursday also vowed more cooperation in oil, mining, gas, agriculture, technology, and industry. Maduro says a right-wing, U.S.-led campaign is seeking to destabilize his administration financially in order to foment a coup and usher in a capitalist leadership. "Venezuelans are going to give a lesson on democracy and liberty to the world on Sunday," Maduro told Erdogan.